Women's Designer Silver Cross Necklace : LOVE2HAVE in the UK! 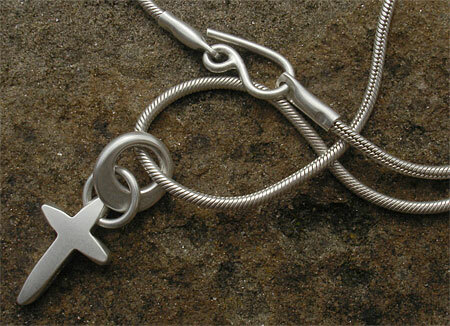 A women's designer silver cross necklace. Modern designer styling for women who are looking for cross jewellery. This necklace is the women's version of the men's contemporary cross necklace. We feature it this time with a sterling silver snake chain that we know most ladies prefer. 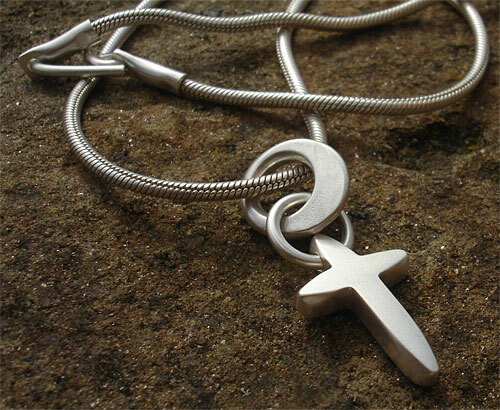 It is a plain sterling silver cross in a matt finish threaded onto a silver jump ring on a 16-inch chain. The silver cross comes in a curved contemporary styling that makes an elegant contrast to the traditional Celtic style crosses we also feature. The silver cross and jump ring measure approximately 25mm in height. A handcrafted silver necklace for women made in the UK - something that little bit extra special for her. Size(s) Available: 16 inches as standard. Metal(s)/Material(s) Available: 925 sterling silver. Returns Policy: You may return this item if it is not to your satisfaction as long as it is not engraved or customised in any way from the specifications listed. Please see our terms and conditions.